A warm friendly welcome awaits you and your family at the family run Copper Coast Mini Farm, Waterford. It is fun and educational for all the family, a safe child- friendly environment where kids can interact with the animals and enjoy a pony ride. Some animals are native to Ireland whereas some are of the more exotic kind. Children of all ages will find plenty to do at this mini pet farm with other attractions and activites aside from the animals such as a sand play area and pedal go karts. It is commonly used for party venues and has special events at Easter. Copper Coast Mini Farm has safety as its priority. The farm is compact and enclosed…no long hikes, the farm trail goes around in a circle so you arrive back at your starting point. The farm and tearooms are all on the same level, no steps to climb up or fall off. Completely buggy and wheelchair accessible, changing facilities, first aid station, competent and experienced staff, guided tours, clean, dry paths, friendly animals, plenty of hand washing facilities, picnic tables indoor and out. Enjoy your birthday party at this unique setting with its unusual and friendly animals and plenty of space and fresh country air for children and adults alike. The kids can take part in all the fun activities in the farm such as digging in the huge sandpit, playing football, driving the toy tractors and trikes or pedalling furiously on the new pedal go-cart track. It’s all fun and its all healthy. At the moment birthday parties are only available durign the summer season April to September. The cost per child is €13 and includes admission, a party table, sandwiches, juice and treats or fruit platter and sugar free ice pops. It also includes a party bag for each child and a present for the birthday boy or girl. They have a new part option – get a 2 hour time limit entry to the farm, use of party barn with all the partyware, cups, plates, balloons, tablecloth and napkins. You bring the food, but please note they cannot reheat any food for you. All adults with birthday parties have free admission. School Tours at Copper Coast Mini Farm last two hours in duration. They are suitable for Pre-schools, creches and primary school children and include a guided tour of the farm, play time in the sandpits and pedal go karts, picnic facilities and wet weather facilities. Teachers are admitted free (1 adult free with every 5 children) and are offered a complimentary tea or coffee and a scone. You need to book early to avoid disappointment as places are limited. 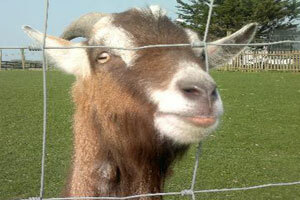 The farm is adapted to special needs groups and very popular with them. It is a safe, enclosed environment where people with special needs can get up close to the friendly animals and enjoy a picnic or cup of tea and a treat in the tearooms. The Copper Kettle Tearooms serve tea, coffee, hot chocolate, sandwiches, scones, cakes, cookies, minerals, ice cream and sweets at reasonable prices. Perfect place to stop in Waterford for a small break or to relax after a day at Copper Coast Mini Farm. Entry to the farm is not necessary to enjoy the Tearooms. The tearooms open at 10.00 and service ends at 17.30. Come and enjoy our newly built playground. We have swings, slides, Tunnels, basket swings & lots more. Last admissions to farm is 5 pm daily. 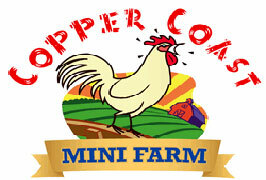 The Copper Coast Pet Farm is situated 4 miles from Tramore past Fenor village on the Dungarvan Road (R675). Follow the South East Coastal Drive from Rosslare or Youghal. From Clonmel / Carrick-on-Suir go through Kilmeaden (N24), turn right for Tramore and follow the signposts.